The fastest and most effective way to improve reading is to treat the underlying impediments. This is what makes our cognitive and reading software different. About 90% of reading problems stem from glitches in phonological awareness and related language processing issues. Our cognitive software and reading programs treat these difficulties directly, and then builds reading fluency, vocabulary and comprehension skills. 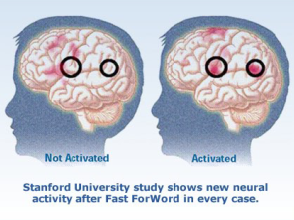 Fast ForWord harnesses the power of brain plasticity — the ability of the brain to change when stimulated — meaning that cognitive skills, the foundation for all learning and reading, can be rewired, improved at any age. Brain plasticity has been called the most important scientific discovery of the last 50 years. It provides a way to change learning using targeted exercises that walk brain function to higher levels by adding speed and complexity in tiny incremental steps. It is almost always more effective and less expensive to treat a problem, rather than solely deal with the symptoms. Tutoring is extra practice, students works hard but, more often than not, remain where they are. If just practice made perfect in reading, every child would be reading at grade level. Gemm Learning gets to the underlying issues, a one-time investment that can save thousands of dollars in future tutoring costs. Language processing skills define how well we learn the language, listen, read and think. But language mastery requires processing at 25 sounds a second. Not surprisingly, processing delays cause the vast majority of reading and learning problems, including attention issues. Fast ForWord was designed specifically to address processing and related skill delays.